I once reviewed the series called The Vision of Escaflowne here. The following review is for the movie and I won't repeat what I said in my review for the series so you might have to click on the above link for a refresher for your memory. There are few anime movies that I think are really great. Those are generally made by Hayao Miyazaki and I would prescribe his movies even to people that don't like anime. Cowboy Bebop: The Movie is in that class, too. There are a lot of anime movies that I think are pretty good to decent, but those are the ones I'd probably recommend to other anime fans. 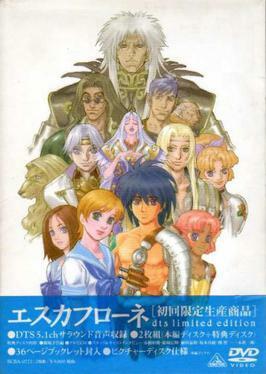 Escaflowne: The Movie is a film I would recommend to nobody. The characters are completely different. I stated that in my other review that I knew they would be different, but the movie assumes you know the series and therefore the characters. Thus there is so little backstory given. I could forgive that if the characters were in fact the same characters from the series, but in all cases the characters have different personalities and roles and there is no apparent reason for it. So why no backstory? The main character Hitomi does seem to fall in love with Van but there is no reason given for it and it makes no sense within the context of the movie. Apparently, she did so just because she did so in the series but since her character is so different... Why bother trying to imitate the series at all when you are doing a re-telling and are generally pretending that the series didn't exist in the first place? Either make a movie that stands on its own or don't make one at all. This movie is an hour and a half. Perhaps the reason that a lot of depth wasn't given to the new incarnations of the Escaflowne characters was because there wasn't any time. Of course, I don't think two hours would have worked either because the movie didn't feel organic from the start. It felt like Escaflowne and Neon Genesis Evangelion were stirred together in one big bastardized pot and most of it spilled on the floor while the rest of it apparently made it to film. Too many characters. Yes, quite a few of them are familiar indeed, but they are essentially given five minute cameos and you are left to wonder what purpose they serve in the first place. Instead of trying to feature every popular character from the series just to please fans they should have tried to make the characters that the movie was actually about the focus of the story. You need to watch the series to really understand anything in this movie, but watching the series doesn't make you appreciate it anymore. It just makes you wonder what the point was in the first place. Especially since the series was pretty darn good on its own. Pretending it doesn't exist is just silly. That's just about the most damning thing I can say about a movie that is supposed to be a re-telling and is supposed to be independent of the series it is based on. So those are my bullet points on why I wouldn't recommend the film to anyone. I didn't hate it. Not sure I even disliked it. I just wonder what the point was. It's okay, I guess. The animation is on par with the series (okay, but nothing great... unless you love pointy noses) and the music is good. The action sequences are pretty good, too. But there just isn't an audience for this type of movie that I know of off the top of my head. If you like the series you might want to watch this movie. You might even enjoy it. But you honestly wouldn't be able to tell me that this movie stand on its own.